European Council president Donald Tusk told Euronews he feels “much better, much safer” after a bilateral meeting with British prime minister Theresa May, as the EU pushes the UK to make concessions that will advance talks towards a Brexit deal. “There is no deadlock, I feel much better, much safer after my meeting with Theresa May. Everything is possible,” he said. “When it comes to this political atmosphere, and very visible goodwill – I am talking about both sides – this all means that we still have a chance to achieve our first goal,” he said at a European summit in Gothenburg. The first goal is the end of talks about the fulfilment of the UK’s existing commitments towards the other 27 members of the EU. Once that has been decided, the discussions can move towards the future relationship between the two parties and particularly the terms of trade between the two. 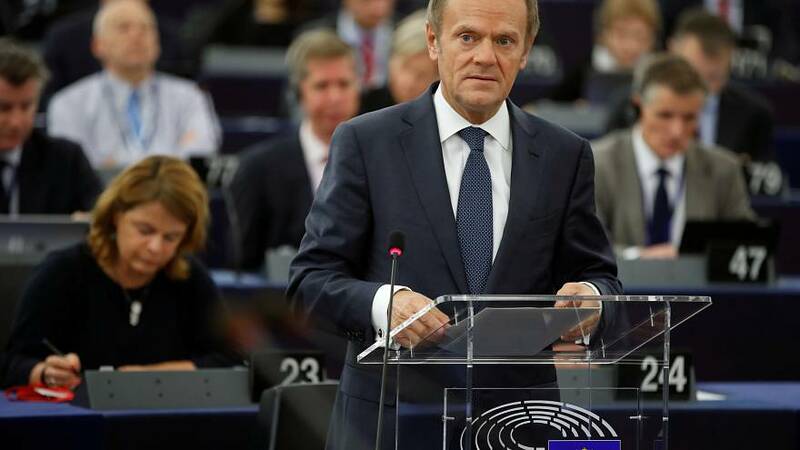 Tusk emphasised that he is not tasked with leading negotiations on the EU side – a job given to former French foreign minister Michel Barnier – but he is nevertheless an influencial figure, responsible for liaison with the EU27 leaders. Earlier on Friday the EU Council president said there was “still more work to be done” on priority issues to unlock Brexit talks. The UK’s Brexit minister David Davis complained earlier that Britain had made “all the running” in finding compromises on the one of the priority issues, the rights of expatriate citizens. Donald Tusk replied that he really appreciated “Mr Davis’ English sense of humour”. The council president’s message reinforced the ultimatum issued by Michel Barnier, who recently gave the UK until the end of the month to give more detail on its stance on the financial settlement. British Prime Minister Theresa May insisted on Friday that good progress was being made at the talks. She signalled again that she would increase an initial offer that is estimated at some 20 billion euros – which is estimated to be about a third of the amount Brussels is seeking. The Irish Prime Minister Leo Varadkar has warned that before the talks can move on, Dublin wants written guarantees to back up British assurances that there will be no “hard border” between the Republic and Northern Ireland, after the UK’s departure from the EU. At the EU’s “social summit” in Sweden, European leaders agreed to promote fair working conditions and equal opportunities. It was the brainchild of the European Commission President, Jean-Claude Juncker. “The UK like others, and perhaps a little more often than others, blocked progress in social matters,” he said. However, he indicated that Brexit would not necessarily make things easier after the UK’s departure. The social summit was the first of its kind for 20 years. “Leaders signed a 20-point declaration aimed at reinforcing employment and social rights. While it’s neither about the creation of a social union, or a legally binding text, the EU officials involved say this is a first step towards a more social Europe,” Euronews correspondent Efi Koutsokosta reported.